CHINATOWN — Over the weekend, someone cleared the weeds that plagued the landscaping around the Chinese American Veterans Memorial. You might think the City of Chicago ordered maintenance workers to cut down the weeds just in time for Memorial Day celebrations. But you'd be wrong. The work really budded from the kindness of a stranger from Milwaukee who traveled two hours to Chicago with a carful of gardening equipment to pretty up the patch of blight that had some Chinatown residents concerned. Eric Hsieh, a 38-year-old Chinese-American originally from California who served nine years as an intelligence officer with the Air Force, learned of the memorial’s disrepair on Facebook. After seeing a DNAinfo Chicago story online about the memorial, Chinese-American veteran Eric Hsieh, 38, drove from Milwaukee to spruce it up. Here&apos;s what the memorial looked like after his work. On Friday, he found a DNAinfo Chicago story about the memorial posted on the group page Asian Pacific American Veterans. Hsieh was familiar with the memorial. The popular tourist attraction had fallen on hard times since construction workers erected it in 2005. The floodlights, recently replaced by the City of Chicago, sported smashed glass and busted bulbs. Weeds covered the landscaping that once featured green shrubbery. So Hsieh got in his car Saturday morning, stopped at the store for some gardening equipment and trash bags and then pointed his car south for Chinatown. Before heading to the memorial, though, he stopped at the Chinese restaurant Joy Yee for some beef brisket udon — his fuel for the day of yard work that would follow. 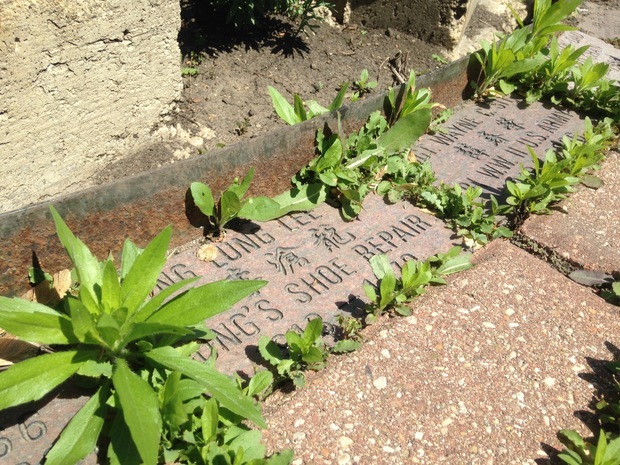 Hsieh got started around noon, clearing the weeds sprouting between ornamental bricks carved with the names of local Chinese-Americans who served in the military. Then he began ripping out the tangled weeds weaved through the landscaping. From the window of her third-floor condo near the corner of Archer and Princeton avenues, 72-year-old Rosalind “Lucy” Toy noticed a man working on the weeds. She walked downstairs to help Hsieh. She soon learned he was a veteran and marketing professional from Milwaukee. Together, they filled six bags with weeds and debris. “We took care of all that work,” said, Toy who, just weeks earlier, started her own campaign to get the memorial cleaned up. She emailed Ald. Daniel “Danny” Solis about the condition of the monument and called the Chinatown Chamber of Commerce. Though the city eventually replaced the broken floodlights on Friday morning, they did not touch the landscaping. City officials applauded Hsieh's efforts to improve the grounds around the neighborhood landmark. "It's inspiring to see veterans serving their community honorably," Solis said in a statement, "and I thank the veteran for his initiative and service to our neighborhood." 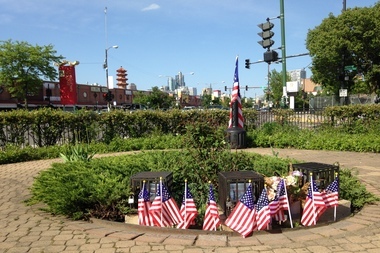 When the job was done on Saturday, Toy showed Hsieh the dumpsters where she often tossed weeds and trash plucked from the memorial. They dumped the trash and shot photos of the spruced-up memorial.